Members of the SJ Innovations executive team celebrate being named the 2018 Metro 50 winner with Mayor David Holt and the Metro 50 corporate sponsors. The Metro 50 Awards Banquet is one of Greater Oklahoma City's most prestigious events. The metropolitan area's fastest-growing privately held companies are ranked based on their percentage of annual growth between 2016 and 2018. Qualified companies are required to have revenues of at least $1 million for the previous year. The rankings of all the Metro 50 winners were revealed during a dynamic dinner on Monday, Sept. 23, 2019 at the National Cowboy & Western Heritage Museum. 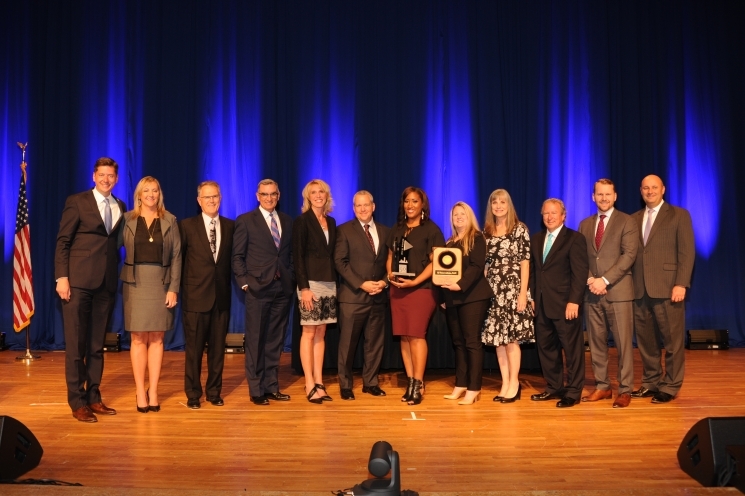 The Metro 50 Award allows both emerging companies, as well as companies that have exhibited a substantial history as an established business, to be recognized. Besides demonstrating positive growth in revenues, Metro 50 companies display growth in the number of employees; creativity and entrepreneurship; and business development through the expansion of facilities and customer base or markets. Call for entries for the 2019 Metro 50 Awards is now open. Apply now! View all the qualifications. The application deadline for the 2019 Metro 50 is Friday, May 31, 2019. If you have questions about Metro 50, contact Meredith Manley at 297-8964. See the list of 2018 winners. Purchase individual tickets or a table of 8 to the Metro 50 Awards Banquet.